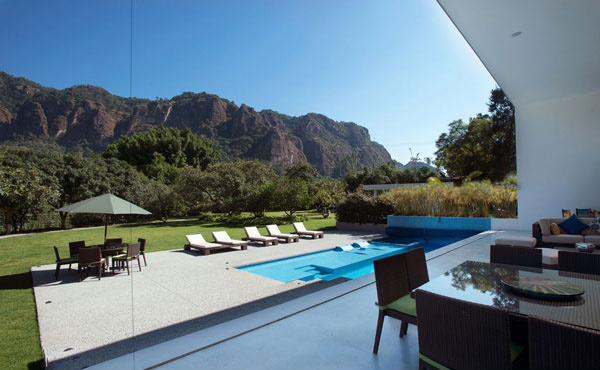 Situated in Tepoztlan, Morelos Mexico is a residential house which has an entertaining and stylish concept designed by the A-001 Taller de Arquitectura. This is said to be inspired by the legend of the Teposteco that signifies the huge volcanic formation in the place. 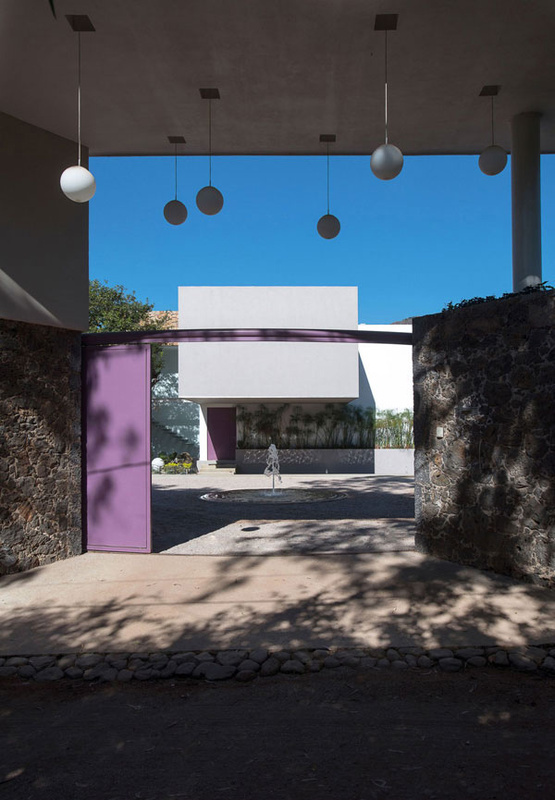 As we take a look at the building you can see that there is a cantilevered structure which created the traditional spaces between the exterior and interior. Also there is a continuous contrast in terms of using the contemporary and regional materials. The sustainability is also one of the main concerns of the designer as they were able to use the solar heaters that can support the utmost energy as well as the natural resources available here. 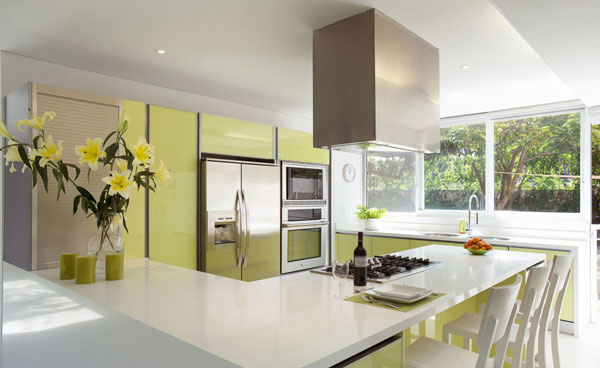 In fact the layout plan of this house creates habitable spaces. It welcomes the environments to be able to experience the country site. This Casa del Viento also cover the intimate angles through its sustainable details namely Mediterranean terrace, a small balconies that can protect the room from solar insulation and a pool that reflects the Teposteco. 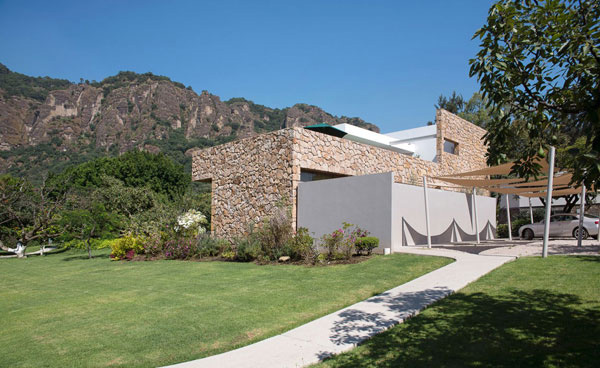 Now let’s take a look at the amazing interior and exterior of this Casa del Viento below. 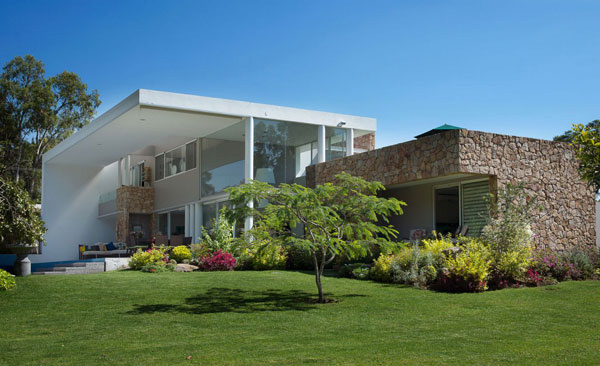 The green landscape reveals this cantilevered volume of this amazing residential house. 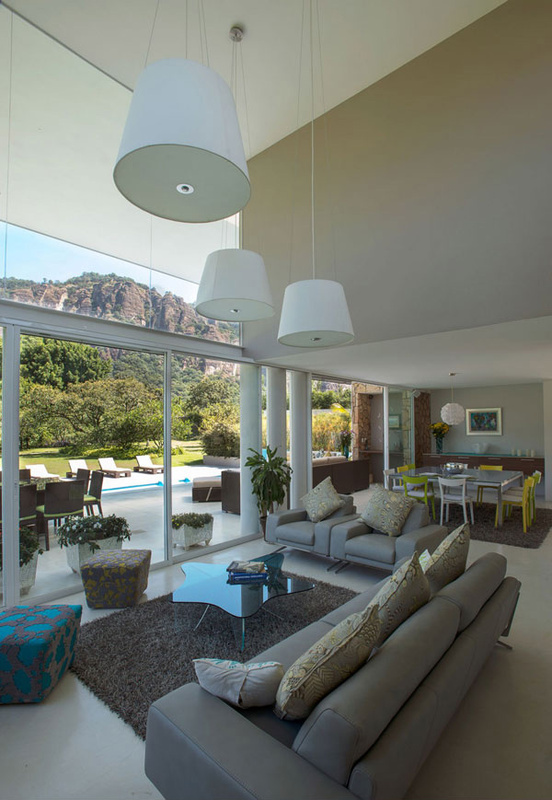 Take a look at the spacious area where the house is seated and its clean and neat landscape. 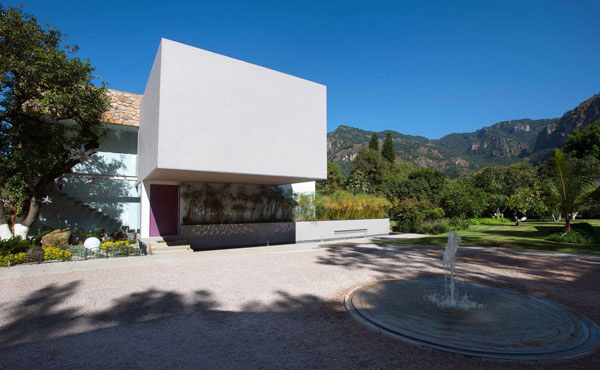 Definitely the geometrical volume of this house emphasized its connection to the environment. 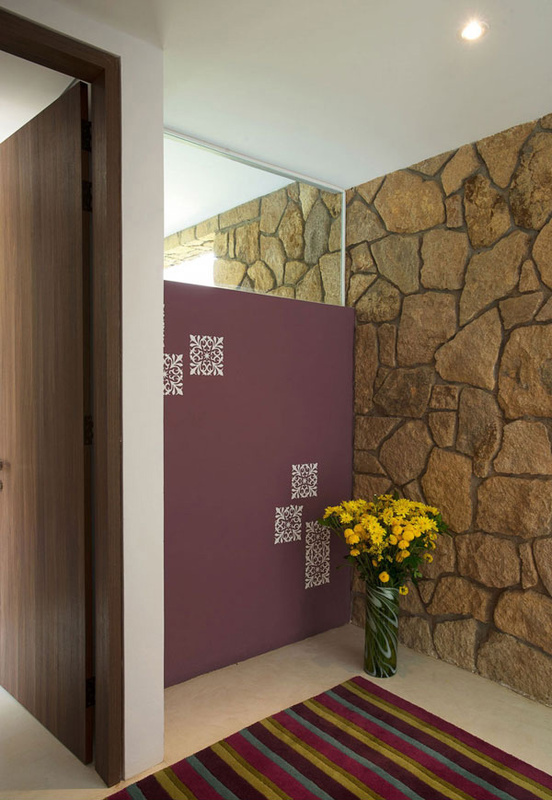 This large gate seems to welcome the client and its guest to explore more of the interior of this house. The fountain installed in the exterior of this house adds more beauty and life here. 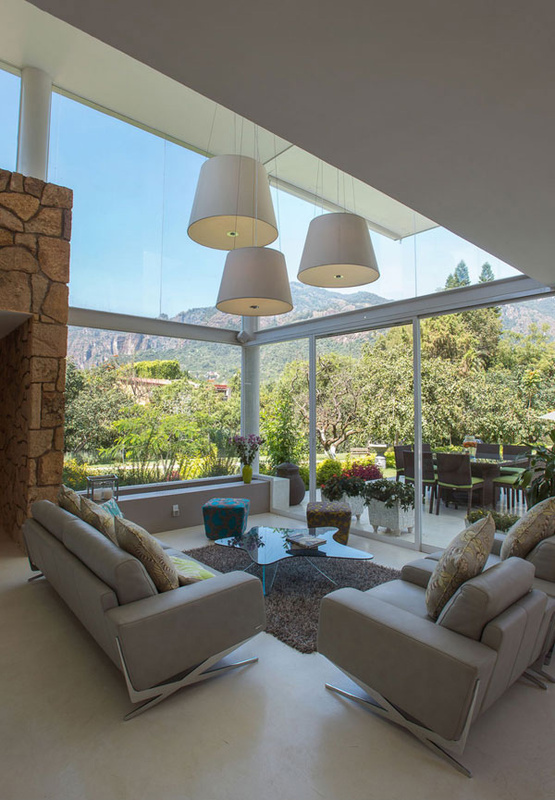 While sitting in this elegant living space you may also take the full advantage of the nature outside through its glassed walls. The furniture set in dining area complements with the color of the sofa beside it. Light yellow, white and brown color combination of the cabinet and furniture here perfectly match with the flowers set in the table. 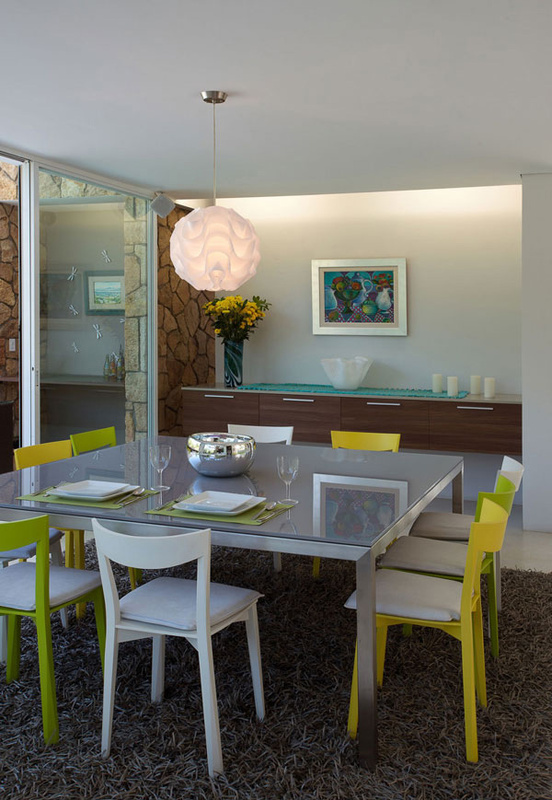 The chandelier placed at the top of this yellow, white, and grey dining set highlighted its contemporary style. 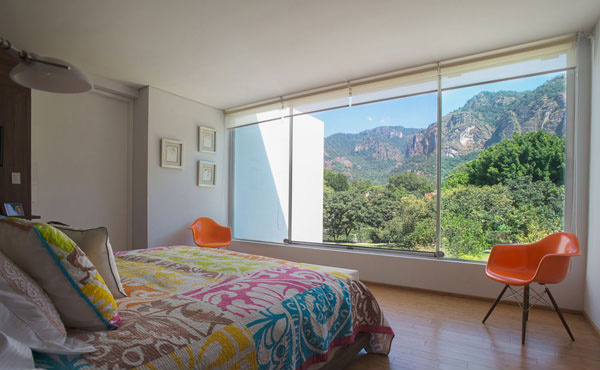 The sight of the panoramic view outside is one of the best reasons why you will find the real comfort in this house. You may take a glimpse of the work of art set in every corner of this house. 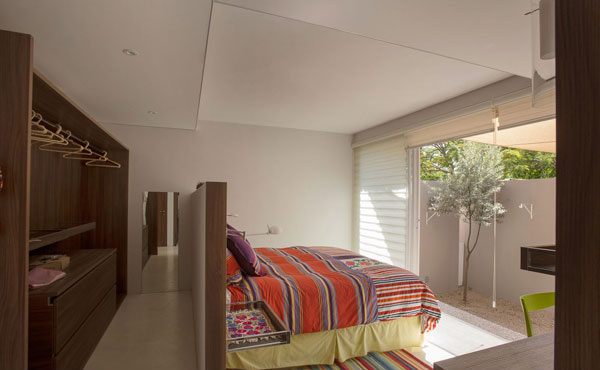 This large bed with its colourful stripe mattress stands out in the middle of this white bedroom. Even in the mattress and this orange chair creates an artistic expression that jives with the white paint in this bedroom. 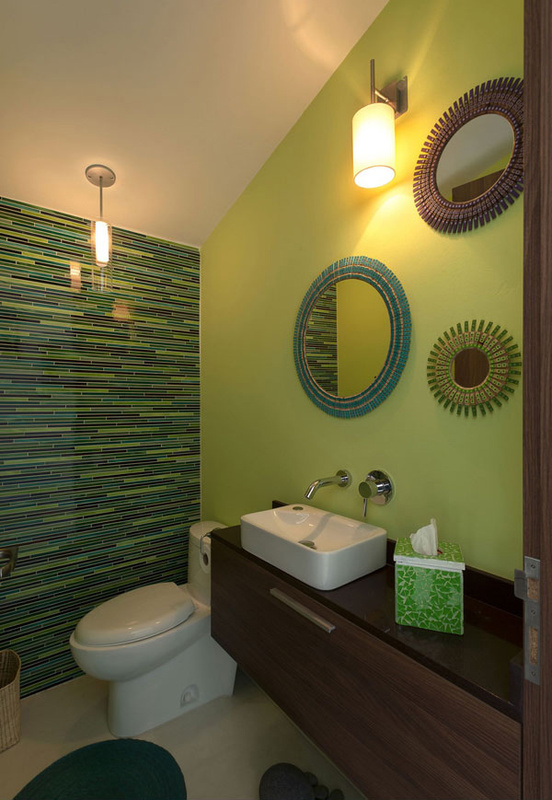 The color of these modern round mirrors installed in this green bathroom proves that the designer think of the environment as its concept. 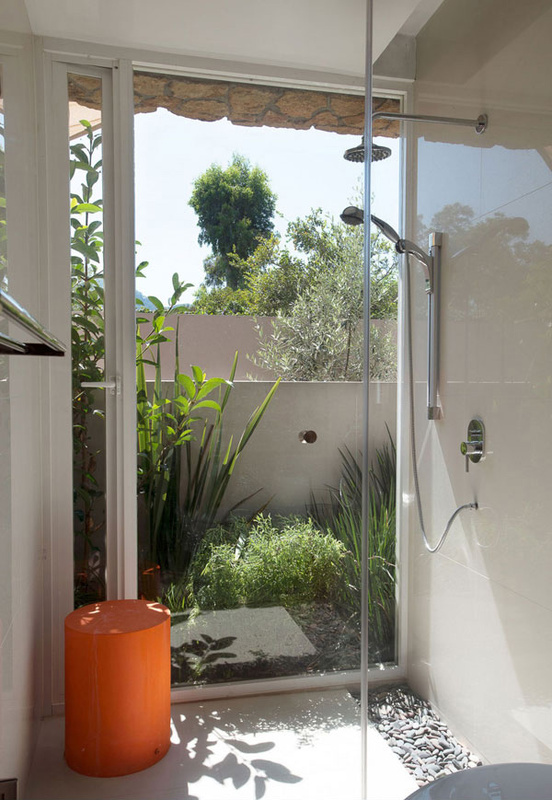 The green plants outside from this shower area usually provide more comfort to the homeowner. 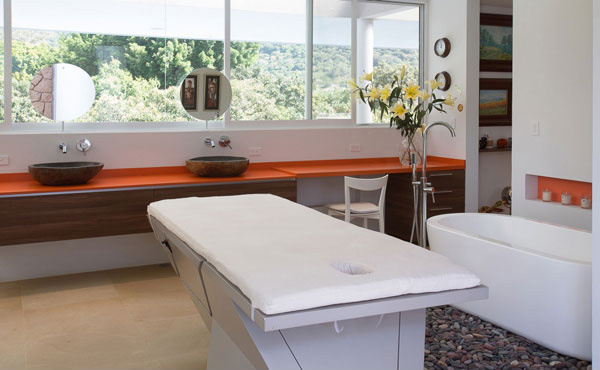 The white tub together with the orange and brown color combination used in the wash area is enough to display a more sophisticated bathroom. This blue lap pool installed in this spacious backyard is one of the perfect places in the residence. The volume of this edifice as well as the lines displayed on every angles of of this house emphasized the brilliant idea of the designer. Indeed the house design of this Casa del Viento is successfully conceptualize and realized by the A-001 Taller de Arquitectura . 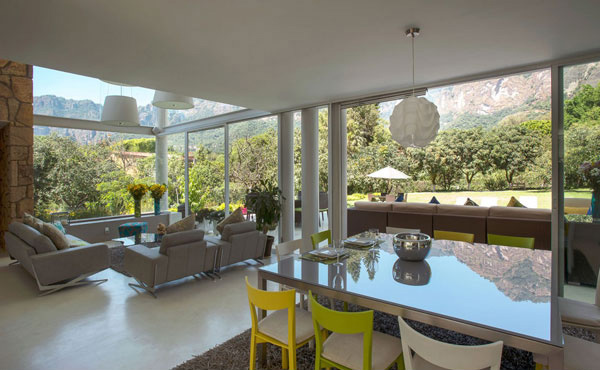 The sustainability and comfortable interior as well as the exterior were achieved as it is the main goal of the client. 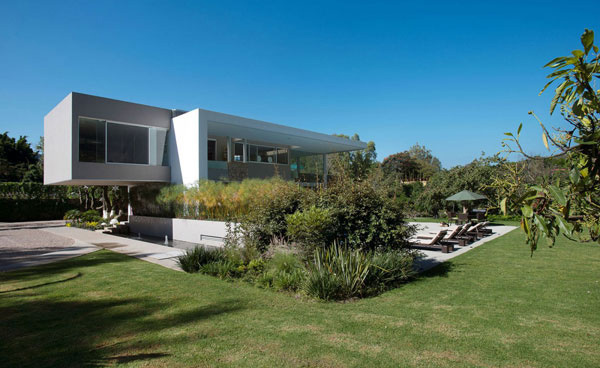 Then we can say that the concept and design of this house may be highly recommended especially for those people who loves nature and would like to have a very strong connection with it.